Your school's ACT scores are a big deal, but so is your time. Our ACT Boot Camp is the only one-day workshop designed to help students meet ACT college readiness standards. We know you're busy, but you still want to make sure your students are prepared for their big test day. MasteryPrep’s ACT Boot Camp is test prep that fits your schedule—even at the last minute. We've worked hard to develop practical, last-minute ACT prep for the “final hours” before test day. 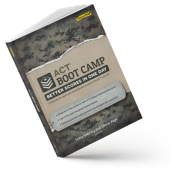 Years of careful analysis and expert evaluation have gone into developing the lessons, essential skills, and strategies covered in the ACT Boot Camp. Schools using our ACT Boot Camp see an average overall increase of 1–2 points. A crucial part of all of our ACT Boot Camps are our trained instructors. A MasteryPrep-trained expert will lead students through their workbooks, sharing effective strategies and tips for your students to practice in the days leading up to their test date. Your students will cover content-strategies for all four subjects tested on the ACT. Each subject comes with mini-tests that the instructor will use as a simulation of a real ACT test day. After students complete each mini-test, the instructor will go over any questions that the students might have gotten wrong or had difficulty solving. Each student participating in an ACT Boot Camp will receive their own take-home ACT Boot Camp workbook for extra practice and study. The workbooks equip your students with actual ACT questions and detailed answer explanations for any questions where further clarification is needed. ACT Boot Camps can be scheduled during the school day or on the weekend. It's never too late for an ACT Boot Camp. We've specially designed our workshop to be implemented in the final weeks leading up to a test. Ready to book an ACT Boot Camp for your school?